Texas Marine is great, and the proof is right there in the trophy case! 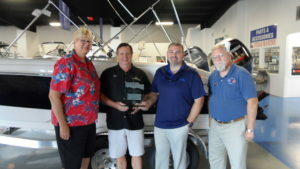 Over the last five years, Texas Marine and the US Sail and Power Squadron Houston have teamed up to provide more than a hundred Boaters the opportunity to earn the Texas Boaters Education Certificate. For this, the two organizations were jointly awarded the Brunswick Platinum Award for Outstanding Efforts in Boater’s Safety. The Brunswick Corporation is a is a major boat and outboard motor manufacturer, and this program is intended to encourage their dealers to support the United States Power Squadron boating safety programs. The boating safety course available at Texas Marine – on IH-45 North, at the Gladstell exit, in Conroe, is taught by the Houston Sail and Power Squadron to provide a basic knowledge of boating, rules of the road to prevent collisions, required safety equipment, how to trailer a boat. It conforms to Federal Boating Standard guidelines, and is required for all boat operators in Texas born after September 3, 1993. More information about the US Power Squadron Houston (we are America’s Boating Club), our organization, our education and our services, is found at https://americasboatingclubhouston.org/. Such a great group of people! Both Great organizations! Yep. Great stuff! Helping improve safety on one of Texas’ most dangerous lakes, where the distinction is earned by having the greatest number of boating accidents – most caused by boaters who either don’t even know there are boating laws or who ignore them.